The motorcycle Marc Eblin II was reportedly on while fleeing. 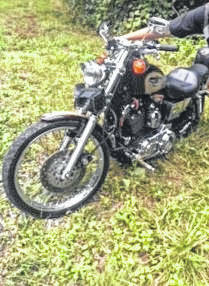 GALLIPOLIS — Gallia Sheriff Matt Champlin announced that deputies from the Gallia County Sheriff’s Office, with assistance of Ohio State Highway Patrol Troopers and officers from the Gallipolis City Police Department, took a suspect into custody Thursday, after a motorcycle pursuit in Gallia County. Taken into custody was Marc A. Eblin II, 39, of Gallipolis. Champlin said that a deputy observed Eblin riding a 1998 Harley Davidson Motorcycle on US 35 at Ohio 160 in a reckless manner. When the deputy attempted to pull Eblin over for the violations, he fled from officers leading them on an approximately 11 mile, 15 minute pursuit out Jackson Pike past the fair grounds. Eblin continued to elude officers as he traveled at speeds exceeding 90 miles per hour until he was apprehended on Saffard School Road after a brief foot pursuit. Eblin was charged with third-degree Fleeing and Eluding a Police Officer along with numerous other traffic-related violations. “I cannot be happier than to provide Mr. Eblin with a safe place to rest his weary head after putting our officers and our citizens at such a grave risk. My message is clear, do not run or try to escape from our officers. We will catch you and we will have a place reserved for you to stay if you jeopardize the safety of our citizens or officers,” said Champlin. Champlin thanked colleague law enforcement for their support along with the dispatchers at the Gallia County 911 Center for coordinating communication with all involved.